All I know about the fairy tale of the Twelve Dancing Princesses is that the poor girls were tricked into wearing enchanted slippers that made them dance until they were exhausted. And while Entwined centers around the story of twelve princesses who love to dance, the story is much more than just a cautionary tale. It is Christmas Eve, and time for the annual Yuletide Ball. Azalea, as the eldest, is the hostess this year, as her Mother, the Queen, pregnant with her twelfth child, has been ill for quite some time. While attending to the guests (and while the rest of her sisters sneak downstairs to watch the festivities), the baby is born and the Queen dies. The household is in mourning, as is the custom, for one full year. This means that the girls must wear black; cannot leave the house, even to walk in the gardens; the windows are covered and, worst of all, there will be no dancing. The King has distanced himself from the girls, and is gone for a few months fighting a war while they are stuck inside the castle. Even when he returns, the King ignores his children, choosing to hide away in his library. There used to be magic in the house; in fact, it was everywhere. The High King D’Eathe, who was the first king, used it in dark ways. Worst of all, it was rumored that he kept people’s souls, forcing them to stay in the castle forever. All that is left from those days is an enchanted tea set…or so Azalea thinks. After an encounter with the handsome and sweet Lord Bradford, Azalea learns of the magical passageways that are all over the castle. Many have been closed down and used for storage, but it is rumored that there are some yet undiscovered. Much to her delight, Azalea finds an entrance in the fireplace in the room where the girls sleep. Using the silver handkerchief that her mother gave her, Azalea finds the mark of D’Eathe and uses the hanky to gain access. What she finds on the other side of the wall is amazing. All twelve sisters find themselves in a beautiful forest where everything seems to be dusted with silver. The crowning glory is a pavilion where an orchestra plays and people dance. Here is where they meet the Keeper, a handsome man who allows them to return night after night to dance to their hearts’ content. But all is not right in the castle; the King has pulled away from the girls; suitors have been allowed to start courting the older girls and the old black magic may not have died out with The High King. Who can Azalea trust, especially when she swore on silver to protect her sisters? I finally got around to reading this book during my recent vacation. I have had it checked out from the library for almost three months, I am ashamed to say. For some reason, I wasn’t drawn to it and kept putting off reading it. How silly of me. This book more than impressed me with its fairy tale style: good and evil, not knowing who to trust…the poor princesses who don’t have a choice in how they mourn, where they go or who they marry. I loved the names of the girls; all plant-related, born in alphabetical order, from Azalea to baby Lily. Each girl has her distinct personality, thought it it the eldest that we get to know the best. The trickery is subtle, and thought you know something bad will happen, it isn’t telegraphed a mile away. Everyone has their secrets, and they slowly come to light over the course of the tale. Not a prissy story in the least – but definitely one where the sisters learn what they are made of. The Bottom Line: A mesmerizing narrative that will have you turning the pages faster than you can dance a jig. 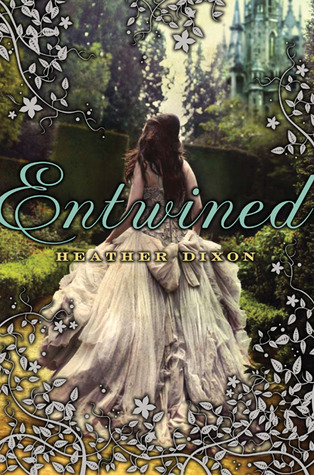 Entwined by Heather Dixon was published March 29, 2011 by Greenwillow Books. Ink and Page picked this book up from the library, so no one had a choice about whether it was reviewed.